Welcome to the last newsletter of the year. As the festive season approaches, let us reflect on the past year, spend some much needed quality time with family and friends and start 2019 rejuvenated. This has been a very challenging year for South African foundries with the market continuing to shrink and environmental issues (emissions) threatening the existence of the sector. One of the biggest challenges faced by local foundries is import leakages. SAIF and AFSA in collaboration with the National Foundry Technology Network (NFTN) have started engaging SOE’s to try and understand their procurement practices and investigating the lack of sourcing locally. However, all is not lost, according to an article published on Moneyweb entitled Manufacturing outputs jump, boosting rand on 11 December 2018, a statistics agency released a statement that manufacturing output rose by 3% year-on-year in October, driven by better vehicle and metals production. SAIF training courses have once again proven to be very successful with 420 foundry employees and learners trained in 2019. Support for the courses from industry has been excellent and our thanks are extended to the industry and all the facilitators who devoted their effort to the success of the programme. Three courses have been scheduled to start in January 2019. You can contact Marina in the office for more information. The Gauteng Foundry Training Centre (GFTC) produced its first graduates, five engineering patternmakers and five moulders. I would like to inform industry that these graduates are still looking for employment and encourage you to contact the office if you would like to provide an employment opportunity to these candidates. Amongst other highlights for 2019 is the GIFA/NEWCAST Exhibition that will be held in Germany from 25-29 June. We are eagerly awaiting feedback on our application for a National Pavilion at the event and are hopeful that the South African cast metal industry will be represented. GIFA will showcase latest technology with improved efficiency, improved environmental friendly materials and processes, latest industry trends, and adoption of industry 4.0. I would like to take this opportunity to wish everyone a blessed Christmas and a very happy and prosperous New Year. The annual SAIF Golf Day was held on 15 November at the Reading Country Club with 35 fourballs and 140 players. 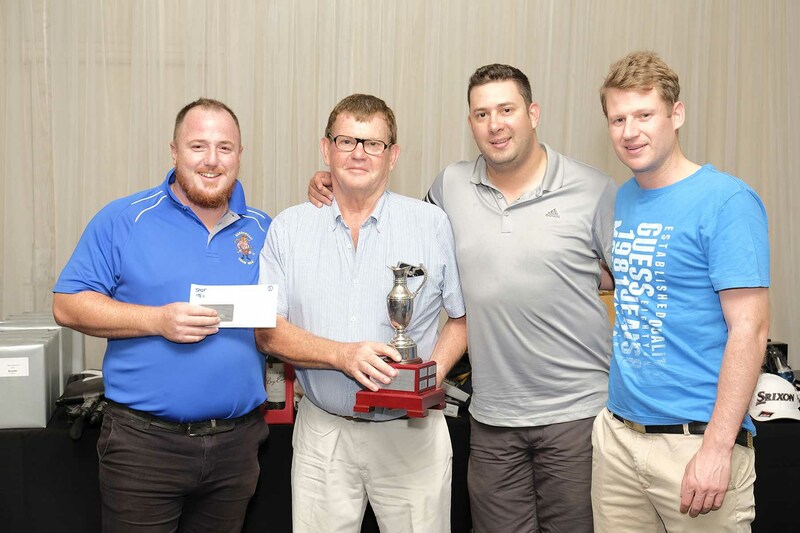 1st Place – Brad Simpson, Twayne Stewart, Gareth Dane & Michael Welman with a score of 98 Playing for Ametex. 1st Place Winners with a score of 98 playing for Ametex. The SAIF would like to thank all the companies that sponsored prizes, tee boxes and greens. Minute Man Press, Roy Dias, Reading Country Club, Zelda Rasmini, SAIF Board of Directors. Members are reminded to ensure that their membership fees are up to date for 2018 as 2019 membership fees are due in February. Members are also requested to update their personal and company information with the SAIF office, regardless of whether it has changed in the past year. To access the comprehensive SAIF, industry and partner events for 2019 visit the SAIF Calendar by clicking here. The SAIF office would be closed from 14 December 2018 and will reopen on 7 January 2019. On behalf of the SAIF Board of Directors we would like to wish all our members a very blessed Christmas and a prosperous New Year. We thank you for your valued support and input during 2018.